It’s always a bit of a gamble getting handed a local release to review. On the one hand I certainly want to help out local acts, but if an album isn’t really to my liking, it puts me in a difficult position - I can’t lie and say it’s good and I don’t want to annoy anyone by saying I don’t like it (Adelaide is, after all, a small town). Which is why it’s such a pleasure to be handed a release like ‘Suburban Dreaming’, because, with no bias or incentive whatsoever, I can say that it’s a wonderful, beautiful, stirring and emotional debut album and that Huckleberry Swedes are one of South Australia’s bands to watch. It all kicks off rather innocuously with Dust Storms Falling, opening with gently strummed acoustic guitar and mellow piano before Troy Loakes’ impassioned voice peals forth from the speakers. Gradually the track builds up to incorporate gentle mandolin melodies, beautiful harmony vocals and a truly stirring string section. The best thing? It’s only the first of many highlights from these talented polymaths, who combine elements of alt-country, folk, gospel, blues, soul and every type of music which is good for what ails you. The bluesy Will My Heart Stay On Track should certainly be a contender for a single, with its funky blues guitar riffing and strong backbeat. Again, Loakes’ singing is right up front, delivering a gritty, soul-style vocal which turns heart-wrenching in the extended coda, combined with butter harmony vocals. It’s not all melancholy, though - Huckleberry Swedes also exceed at more upbeat material, with We Farm Our Love based around a rather delightful mandolin riff, and the jaunty Cast A Line, a countrified ode to the simple joys of fishing. At all times the arrangements are solid and well-thought out, and the palette of acoustic guitars, mandolins, banjos, subtle drums and fruity Hammond organ, with flourishes of pedal steel, dobro and strings, is simply joyous. The warm, organic and very live feel which producer Jim Moginie (Midnight Oil) has created fits the material and the players to a tee, and is never over-complicated, never too shiny nor too raw. Closing track Baby’s Gonna Lift Me Up is almost perfect, combining a melancholy feel with a life-affirming vocal melody of almost gospel intensity. It’s a slow burner with an uplifting finish. Suddenly, ‘Suburban Dreaming’ is over, and you’ll find yourself reaching for the play button again, if only for the big grin that it’ll surely put on your face. Track this down, listen to it, love it, listen to it again - there is nothing else to add. South Australian five-piece Huckleberry Swedes have released their debut album Suburban Dreaming after three years together and it’s a languid philosophy lesson delivered in stirring harmonies and earthy verse. The Swedes are alternative country/roots rock with vivid soul and bluesy elements and musical flavours that vary from Springsteen to Xavier Rudd. They have packed a lot into their sound, but masterfully; and it flows smoothly, fuelling their loose folksy choruses and swelling anthems. Suburban Dreaming is full of big rustic drums, thrumming bass and plaintive piano cutting through layers of deft strings. They seamlessly integrate fluid violin and cello with banjo, accordion and mandolin throughout the album. Vocals range from the emotional Will My Heart Stay On Track - sounding like Live’s Ed Kowalczyk incarnate - to Memphis gospel style flourishes, which would make James Brown proud in My Luck Is Changing. The album blends melancholy ballads like Somewhere By Sundown with jangly anthems Hair Trigger and We Farm Our Love, and soulful hymns in Rise And Fall. Tracks Wild Peach Pie and Cast A Line conjure deep south dreaminess, singing moonlight and fishing, peach pie and cattle trains in homage to the pastoral world of Mark Twain’s Huckleberry Finn - from which they took their name. The Adelaide boys do also bring the love home to our own heat baked shores with the powerful Duststorms Falling, and Small Cage, Big Land. As musically refined as their image is laid-back the Huckleberry Swedes woo you leisurely, celebrating the simple life and musing the big questions in rich, lively melodies. A lot of people like to say that there are no new sounds in the music industry today, however that simply isn’t true. Adelaide five piece Huckleberry Swedes have a unique sound that even has rock historian Glen A Baker excited. These guys take the old Motown blues sound and mix it with a fair whack of soul and alternative country, and the result is ‘Suburban Dreaming’ an album that sounds so sweet that you will have it one repeat for days. There simply isn’t a bad track on this album and from the opening bars of ‘Dust Storms Falling’ you know you are onto something special. The sound of soul and country mixed in together hits you straight away and it sounds great. Troy Loakes’s vocals sound terrific on ‘Will My Heart Stay On Track’ and the poppier rock sound of ‘Small Cage Big Land’ instantly reminds you of Paul Kelly. The variety of sound to be found here is there for to see with ‘We Farm Our Love’ which has a Brit-rock sound to it and then that is followed up by ‘My Luck Is Changing’ which sounds like it hails from American’s Mid-West. It doesn’t matter whether Huckleberry Swedes are doing folk (on ‘The Rise And The Fall’), sweet rock (like on ‘Somewhere By Sundown’) or country (‘Wild Peach Pie’, ‘Hair Trigger’ and ‘Cast A Line) they remember to include sweet melodies and amazing lyrics that make this one memorable album indeed. ‘Suburban Dreaming’ is a stunning album by an amazing band whose sound will see them go a long way. It would seem, over the past few years, there have been a number of bands on the Australian alt.country / rock n’ roll scene (in the vein of Wilco or the Cardinals or even Crazy Horse) who have been honing their guitar-based chops, and so just recently a slew of them have come to the fore. Downhills Home, the Wildes, and now from Adelaide, the Huckleberry Swedes, a five-piece guitar driven country rockin’ band whose sugar sweet melodies entwine with some jagged fretwork to create what is a debut record worthy of some serious attention. Suburban Dreaming is the record, an album which has been some time in the making, or perhaps I should say some time in the releasing, given it was recorded in ’07, mixed and mastered in early ’08 and so has sat on a shelf until now, but I tell you what, it’s been worth the wait. Frontman, Troy Loakes and his foil, Mark Elberg spent the 90s travelling through Europe as a duo before forming Canvas (who dropped only the one record), and it seems with the Swedes then, they’ve found their grail. Produced by the Oil’s Jim Moginie, and with help from Bill Chambers, this is a winner of a record, and one can’t help but wonder what they’ll bring out next. Where the hell have these guys been hiding? Why wasn’t I told? Out of South Australia, this remarkable debut has ‘Next Big Thing’ written all over it. The Swedes are no pale imitators but I’ll offer some ballpark comparisons for reference sake: shades of The Band, Ozark Mountain Daredevils, The Faces and all manner of electrified, countrified rhythm and soul. Suburban Dreaming opens with the relaxed and assured intro and sweeping orchestrations of ‘Dust Storms Falling’. Their years accumulating polish and passion on local and faraway stages is evident. Songwriter Troy ‘the colonel’ Loakes exercises a mighty set of lungs with finesse. Trying to pinpoint who he reminds me of has nearly done my head in. [Maybe Roger Daltry or Bob Seger with the phrasing of Van Morrison and the tonal elegance of David Surkamp (Pavlov’s Dog)]. ‘Somewhere by Sundown’ paints an atmospheric panorama of lonesome boundary riders. ‘Cast a Line’ brings out the early Rod Stewart in Loakes vocals, while he gets a-testifyin’ on ‘My Luck is Changing’ and rousing final track ‘Baby’s Gonna Lift Me Up’. Have Mercy! Affectionate stories of love and the land are adorned by a lush setting of harmonies, rhythms and strings including guitars, banjo and mandolin from co-founder Mark Elberg. Clearly, drummer BJ Barker and bassist Sam Willoughby could fill the shoes of any eminent rhythm section. Guests add Dobro, lap steel and Weissenborn (Bill Chambers) and violin, viola and cello. Midnight Oil’s Jim Moginie adds to the fulsome sound on keys. Moginie acted as producer and, with engineer Mick Wordley, mixer.) Special mention for James Fosdike’s playful cover art. Like the music, it’s rootsy and real with the potential for mass appeal and that ain’t a bad thing. Paul Kelly has lost no cred plying such wares. A funny thing happened to me after only a couple of listens to this album. I woke up in the middle of the night with ‘Small Cage Big Land’ running through my head - note for note, word for word. If I owned a record company, I’d be releasing it as a single tomorrow and bettin’ the farm on it. The Huckleberry Swedes, one of our best home-grown bands, has an impressive new album with 12 well-crafted songs inspired by alternative country, rock, roots, soul and the occasional pop fl ourish. The fi ve-piece band creates genuine foot-tapping music with smooth harmonies and rocking guitars in this polished production. Lead singer Troy Loakes has a fantastic voice - think of Neil Young meets Elvis Costello meets Michael Spiby (Badloves). Great tracks include popstyle Small Cage Big Land, rootsy My Luck is Changing and rock hit Wild Peach Pie. The Huckleberry Swedes also deliver brilliant live shows. Check their website for dates. It’s a rare thing, in my experience, for an album’s cover art to be so faithful to its content. One look at the front of Suburban Dreaming and it’s clear that broadly roots-based outfit Huckleberry Swedes take the everyday as their muse, incorporating into it a touch of the magical and a sense of underlying turmoil. Lead singer, Troy Loakes’ voice is kept raw and confronting throughout the album both in terms of his delivery and the near-distrorted mic-hugging way it has been recorded. While there are some points, such as the ostensibly mellow We Farm Our Love that this amounts to overplay, for the most part it gives the album an urgency that really sells it on the emotional front. First track Dust Storms Falling speaks of being caught up in forces that, for better or worse, you can’t control (a theme that really runs throughout the album). The song’s late-swelling use of a string section is a masterstroke. Will My Heart Stay on Track is seemingly more countrified until its gospel-tinged choral vocals turn it into an existential prayer. A very impressive trio of opening selection is rounded out with Small Cage Big Land – a more lightweight affair with an infectious hand-clapped chorus that jumps out as a prime choice for single. Somewhere By Sundown is where the band really reveal their sensibility for narrative – as the lyrics tell of a relationship built on shaky ground, subtle and otherwise incongruous production touches are added to the folky acoustica to add a sense of desperation. There are lighter moments too...The band show more of their country influences – in fact they erupt from them with delightfully carefree (and cornball) abandon – in Wild Peach Pie. Likewise, the blues can never be far away from any broadly roots-based album and it reveals itself in full force with the edgy, 12 bar abandon of My Luck Is Changing. The album’s mixed pedigree of contemplative country and emotionally intense soul-rock is perhaps reflected by two of its guest instrumentalists Midnight Oil’s Jim Moginie and Bill Chambers (Kasey’s Dad) whose Dobro playing gives ballsy backbone to some otherwise less memorable songs toward the end of the album. The band’s Suburban Dreaming comes to an end with the slow-building soul of Baby’s Gonna Lift Me Up – a song bound to get hands in the air at the band’s live gigs. The Huckleberry Swedes take the habitual mellowness out of roots music and put in its place a sense of genuine emotional urgency and failing that, a sense of fun. In short: Rockin' Roots with a story to tell. Roots rockers Huckleberry Swedes have put their best feet forward with this 12-track set. After gaining a good rep as hard working entertainers (and Bill Chambers backing band when he's in town), the SA based, festival-seasoned act delivers souped up and slaved over Australiana alternating between rock out and held-back. Vocalist Troy Loakes leads the charge. The Swedes strengths show best on beauties such as the cleverly restrained anguish of "The Rise And Fall", suprisingly bluesy "My Luck is Changing" heart busted mandolin ballad "Somewhere By Sundown", and prove a dab hand at upbeat country pop with "Small Cage Big Land". They have the guiding hand of Midnight Oil's Jim Moginie as producer and guest musician. The sound of these ragged rocking storytellers scrubs up handsomely. Suburban Dreaming by Adelaide group the Huckleberry Swedes is a startlingly confident and realised debut album of country-flavoured roots rock. Troy 'The Colonel' Loakes plays the guitars, writes all the songs and sings in an exciting, celebratory voice that lifts the spirit. Midnight Oil's Jim Moginie played piano, produced, recorded and mixed it and Bill Chambers adds some tasty lap steel. Not since Cold Chisel has a group come roaring out of South Australia with such a powerful, originally written crop of roots rock. I have long been an admirer of the Adelaidean “Swedes”, and that admiration is further swelled by their first full-length album, Suburban Dreaming, produced by Midnight Oil's Jim Maginie. The Swedes have delivered on their early promise in a way that shatters the mythology of the local music scene being little more than two-chord primal scream. Blessed with an innate ability to play a vast range of (non-standard) instruments, as well as a vocalist in the Young/Kelly ilk and, more importantly, lyrics that are both audible and understandable, the Swedes’ Suburban Dreaming should certainly make an impact locally and nationally. If it doesn’t, I'll take to eating their God-awful vegetable namesake three times a week. Lyrically resonant of John Cougar in his Paper On Fire days, Suburban Dreaming possesses that quintessential American folk/blues appeal, minus the gooey butterscotch sauce. Here, it is served up a tad more ochre and corrugated iron bluesy, which takes it out of the heartland and definitely into the aridness of our dusty backyard. Tracks like “Dust Storm Falling”, “My Luck is Changing”, and the rootsy “Somewhere By Sundown” afford this album an eerie, melodic hook, more reminiscent of early Neil Young productions than anything else produced locally. With an album that is excellently packaged, written, produced and performed, the Swedes have not only broken through the wall of sound that is pub bash and thrash for no other sake than white noise, they have also given us dust-bowl refugees an album and band we can justifiably recognise and laud as our own, without having to go deaf into the bargain. 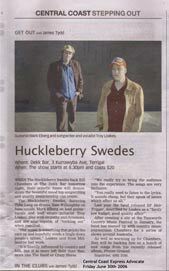 I've been fortunate enough to catch Adelaide outfit Huckleberry Swedes a few times in the past few years, after so many reliable sources had recommended them. So the lead up to this release, the band's debut album, has been one of anticipation for myself and I'm sure for others. The impression I attained from seeing and reading about the band, their success at Tamworth and their association with Bill Chambers (who often sits in with the group) was one of a more traditional country outfit. However, Suburban Dreaming arrives very much electrified, country in the same vein as '70's Rolling Stones, The Faces, or The Black Crowes, rolling along with classic blues, soul and r&b influences popping out everywhere. Produced by Midnight Oil guitarist Jim Moginie and engineered by a live-in-a-room guru Mick Wordley, Suburban Dreaming is rich in sound and vitality, great guitar tones and vintage electric pianos help to colour the songs. But, beside Troy Loakes' incredible voice - he could easily take up a career as a white soul singer if the band ever falls - it's the songs themselves that take the spotlight in Suburban Dreaming. It's one of those great albums where every song reminds you a little bit of a classic, but not enough so that you can actually pinpoint which classic. As the 12 tracks unravel, highlights just keep emerging - from the slow building drama of 'Will My Heart Stay on Track', to the sunny soul/pop of 'Small Cage Big Land' and 'We Farm Our Love, to the best rock song The Black Crowes never recorded 'Wild Peach Pie'. It's a mighty debut and one that should gain the Swedes the recognition they deserve as one of the country's most promising roots rock bands. ........Once again, their sweet harmonies and well-crafted, back-porch foot-tappers proved their reputation."